FordPass makes owning a Ford easier than ever. 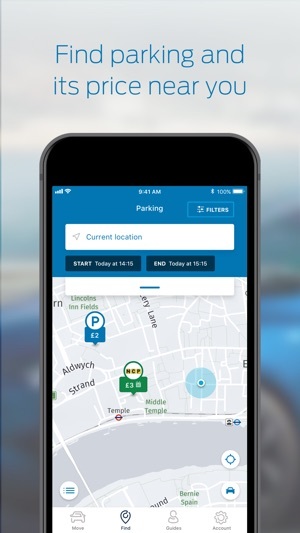 You can use it to find restaurants and cafes, petrol stations and parking spaces. Then you can send the locations straight to your in-car navigation system. Not only that, but you can keep your car at its best with Vehicle Health Alerts too. And soon, FordPass Connect (built into new Ford vehicles) will even let you control features of your car remotely. All through the FordPass app. 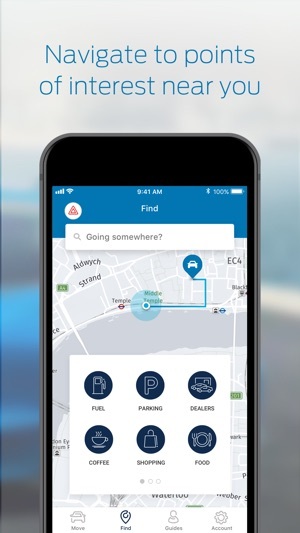 • Search for the best priced fuel stations in the local area or along your route. • Discover cafes, restaurants, cinemas and more. 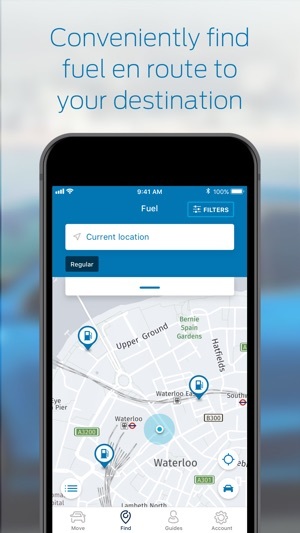 • Connect your phone to your vehicle, so you can keep track of your efficiency with Fuel Reports. 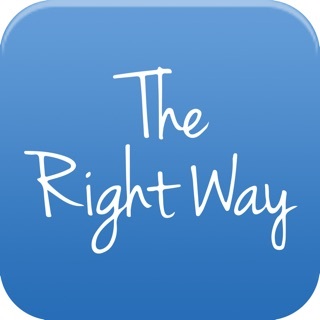 • Get achievements and insights for the distances you’re travelling. • See a useful guide to what all the warning lights on your dashboard mean. 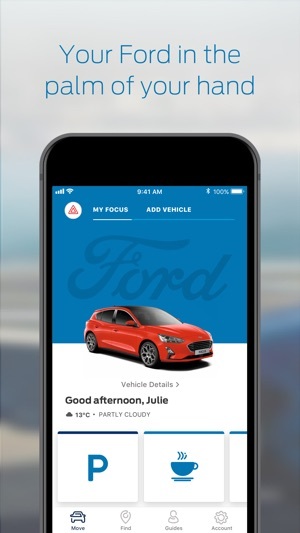 Soon, FordPass Connect will let you pair your phone with your car to unlock a range of even more useful features. • Use your phone to lock/unlock your car remotely. FordPass for Apple Watch is here! With all the best features optimised for the watch, it’s now even easier to stay connected with your vehicle. Just like we do with any update, we’ve been fixing some annoying little bugs, to make sure we keep improving FordPass for all of you. Hej Imad.Hindi. Tak for din feedback. Vi er glade for at se at du syntes godt om FordPass. Hej Carsten. Vi er kede af at se at du føler dette. Har du flere synspunkter eller måske forbedringer og tips til os, er det velkommen til at kontakte vores dygtige FordPass team. Dine synspunkter hjælper os til at forbedre os så du forhåbentligt kan få glæde af FordPass i fremtiden. Hej Fedtspiller. Tak for de fine ord og vi er glade for at se at du er godt tilfreds. Requires iOS 10.0 or later. Compatible with iPhone 5s, iPhone 6, iPhone 6 Plus, iPhone 6s, iPhone 6s Plus, iPhone SE, iPhone 7, iPhone 7 Plus, iPhone 8, iPhone 8 Plus, iPhone X, iPhone XS, iPhone XS Max, iPhone XR, iPad Air, iPad Air Wi-Fi + Cellular, iPad mini 2, iPad mini 2 Wi-Fi + Cellular, iPad Air 2, iPad Air 2 Wi-Fi + Cellular, iPad mini 3, iPad mini 3 Wi-Fi + Cellular, iPad mini 4, iPad mini 4 Wi-Fi + Cellular, 12.9-inch iPad Pro, 12.9-inch iPad Pro Wi-Fi + Cellular, 9.7-inch iPad Pro, 9.7-inch iPad Pro Wi-Fi + Cellular, iPad Wi-Fi (5th generation), iPad Wi-Fi + Cellular (5th generation), 12.9-inch iPad Pro (2nd generation), 12.9-inch iPad Pro Wi‑Fi + Cellular (2nd generation), 10.5-inch iPad Pro, 10.5-inch iPad Pro Wi‑Fi + Cellular, iPad (6th generation), iPad Wi-Fi + Cellular (6th generation), iPad Pro (11-inch), iPad Pro (11-inch)Wi-Fi + Cellular, iPad Pro (12.9-inch) (3rd generation), iPad Pro (12.9-inch) (3rd generation) Wi-Fi + Cellular, iPad mini (5th generation), iPad mini (5th generation) Wi-Fi + Cellular, iPad Air (3rd generation), iPad Air (3rd generation) Wi-Fi + Cellular and iPod touch.